The Different Types of Rug Knots – The so-called knots that make up a pile rug are not actually knots, but loops, wrapped around pairs of adjacent warps. They may be wrapped in several configurations. In all cases they consist of the knot collar – the portion that literally wrap around the warps – and the ends that actually constitute the pile. Asymmetrical knots are rug knots that have the ends coming up singly between each pair of warps with a knot collar around every other warp. 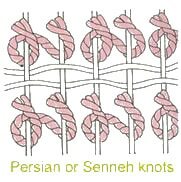 These knots are also known as Senneh or Persian knots. Symmetrical knots are rug knots rgar have both ends of the yarn coming up together between two warps, with the knot collar wrapping around two warps. 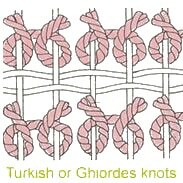 These knots also known as Ghiordes or Turkish knots. Jufti knots may be symmetrical or asymmetrical, but they utilize these configurations around pairs of warps rather than single warps, making the pile less dense and quicker to produce. Spanish knots are wrapped symmetrically around every other single warp in an actual knot, the only rug knot that truly merits the term. 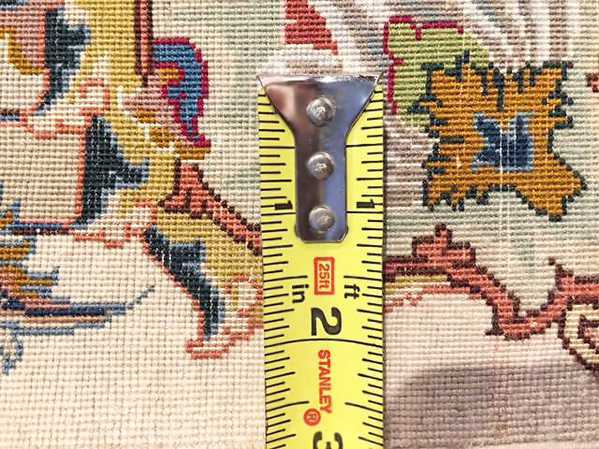 Learning about the KPSI or Knots Per Square Inch – The density of the knots in a rug or fineness of a pile rug is measured by multiplying the vertical knot count by the horizontal knot count within a given area measurement, either square inches or square decimeters. Anything up to around seventy to eighty knots per square inch is considered coarse. As the number approaches 100 or exceeds it, the count enters the medium range. When a rug begins to approach about 200 knots per inch, the weave begins to be considered as fine. The finely woven rugs may have as many as three or four hundred knots per inch, but such a count is considered to be exceptionally and even unusually fine. To some extent the knot count depends on the size of the knots and the warps, i.e. the thickness and horizontal spacing of the yarns. But it also reflects how tightly the rows of knots and wefts are compacted vertically.